IPro restaurant and general food service inventory and recipe cost control software dramatically reduces food and beverage costs by detecting creeping costs, overuse, theft and unknown costs. IPro features periodic and perpetual inventory for food, liquor and supplies, build-to-par ordering, purchase history, vendor comparison, recipe costing and resizing, recipe printing, stock depletion by sales or production, sales and profit history, trends and analysis, and much more. Compare this program to others at ten times the price! Downloadable for immediate and free delivery. IPro is downloadable for immediate and free delivery. You can start using IPro today! IPro installs directly on your computer and is not cloud-based so your data stays on your computer and does not depend on remote web services. IPro is sold as a one-time software purchase and not a subscription so there are no ongoing monthly charges. Food service is different from other businesses. You know that inventory software meant for most businesses doesn't work for your food business-- you need software designed for you. Since 1979, we've delivered thousands of copies of IPro to help run all types of food businesses. If you make or sell food or beverages, you can use IPro. 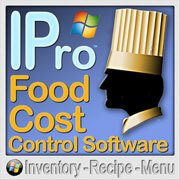 How Do You Reduce Food Cost with IPro? When you use IPro, expect to reduce your food cost by 5% to 10% of sales (i.e. from 35% to 30%). In practice, IPro has reduced food and liquor costs as much as 25%, doubled profits and saved businesses from going broke. Know what your actual food cost is. IPro calculates the quantity and value of stock actually used based on your physical inventory counts. This is the value of stock gone from the shelves for all reasons: used for sales, stolen, wasted, etc. Know what your ideal food cost is. IPro uses your recipes and sales to calculate the quantity and value of stock ideally used. This is the value of stock used if your recipes were followed exactly with no unexpected waste and with sales recorded correctly. Actual food cost and ideal food cost should be the same. Knowing that they are or are not is everything. You can�t solve a problem unless you know that there is a problem. IPro will show you the size of the problems and which items are over- or underused. Know your cost figures quick enough and often enough to make a difference. You should also know your actual and ideal costs for each week by the end of the week; IPro makes this possible. If you only know your costs by the end of the month, it�s too much water under the bridge, and too late to do anything about it. With IPro, you can sharpen your management skills to perfection and do everything regularly that you've never had time to do before. You can make cost management a daily habit and not a last-ditch emergency response. Use the Next link below for more pages about IPro or jump directly to more pages about IPro using the links in the left margin of the IPro pages.